Antigen is a substances usually protein in nature and sometimes polysaccharide, that generates a specific immune response and induces the formation of a specific antibody or specially sensitized T cells or both. Although all antigens are recognized by specific lymphocytes or by antibodies, only some antigens are capable of activating lymphocytes. Molecules that stimulate immune responses are called Immunogens. Epitope is immunologically active regions of an immunogen (or antigen) that binds to antigen-specific membrane receptors on lymphocytes or to secreted antibodies. It is also called antigenic determinants. Autoantigens, for example, are a person’s own self antigens. Examples: Thyroglobulin, DNA, Corneal tissue, etc. Alloantigens are antigens found in different members of the same species (the red blood cell antigens A and B are examples). Heterophile antigens are identical antigens found in the cells of different species. Examples: Forrssman antigen, Cross-reacting microbial antigens, etc. Adjuvants are substances that are non-immunogenic alone but enhance the immunogenicity of any added immunogen. The vast majority of immunogens are proteins. These may be pure proteins or they may be glycoproteins or lipoproteins. In general, proteins are usually very good immunogens. Pure polysaccharides and lipopolysaccharides are good immunogens. Nucleic acids are usually poorly immunogenic. However, they may become immunogenic when single stranded or when complexed with proteins. In general lipids are non-immunogenic, although they may be haptens. These are body’s own cells or sub fragments or compounds or the antigenic products that are produced. The endogenous antigens are processed by the macrophages which are later accepted by the cytotoxic T – cells. Endogenous antigens include xenogenic (heterologous), autologous and idiotypic or allogenic (homologous) antigens. Examples: Blood group antigens, HLA (Histocompatibility Leukocyte antigens), etc. These antigens should not be, under normal conditions, the target of the immune system, but, due mainly to genetic and environmental factors, the normal immunological tolerance for such an antigen has been lost in these patients. Examples: Nucleoproteins, Nucleic acids, etc. Posses antigenic properties denovo, i.e. ther are able to generate an immune response by themselves. Unable to induce an immune response by itself, they require carrier molecule to act as a complete antigen. The carrier molecule is a non-antigenic component and helps in provoking the immune response. Example: Serum Protein such as Albumin or Globulin. Haptens can react specifically with its corresponding antibody. Examples: Capsular polysaccharide of pneumococcus, polysaccharide “C” of beta haemolytic streptococci, cardiolipin antigens, etc. The whole antigen does not evoke immune response and only a small part of it induces B and T cell response. 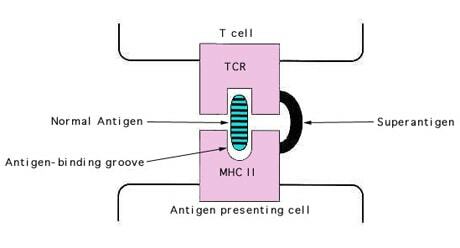 The small area of chemical grouping on the antigen molecule that determines specific immune response and reacts specifically with antibody is called an antigenic determinant. An antigen must be a foreign substances to the animal to elicit an immune response. The most active immunogens tend to have a molecular mass of 14,000 to 6,00,000 Da. Examples: tetanus toxoid, egg albumin, thyroglobulin are highly antigenic. Insulin (5700 ) are either non-antigenic or weakly antigenic. In general, the more complex the substance is chemically the more immunogenic it will be. Antigens are mainly proteins and some are polysaccharides. It is presumed that presence of an aromatic radical is essential for rigidity and antigenicity of a substance. In general particulate antigens are more immunogenic than soluble ones. Denatured antigens are more immunogenic than the native form. Antigen Specificity depends on the specific actives sites on the antigenic molecules (Antigenic determinants). 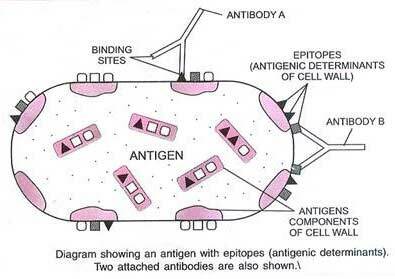 Antigenic determinants or epitopes are the regions of antigen which specifically binds with the antibody molecule. Tissues of all individuals in a particular species possess, species specific antigen. Human Blood proteins can be differentiated from animal protein by specific antigen-antibody reaction. Organ specific antigens are confined to particular organ or tissue. Certain proteins of brain, kidney, thyroglobulin and lens protein of one species share specificity with that of another species. The autologous or self antigens are ordinarily not immunogenic, but under certain circumstances lens protein, thyroglobulin and others may act as autoantigens. Some substances are immunogenic in one species but not in another .Similarly, some substances are immunogenic in one individual but not in others (i.e. responders and non-responders). The species or individuals may lack or have altered genes that code for the receptors for antigen on B cells and T cells. They may not have the appropriate genes needed for the APC to present antigen to the helper T cells. Age can also influence immunogenicity. Usually the very young and the very old have a diminished ability to elicit and immune response in response to an immunogen. Antigens that are easily phagocytosed are generally more immunogenic. This is because for most antigens (T-dependant antigens) the development of an immune response requires that the antigen be phagocytosed, processed and presented to helper T cells by an antigen presenting cell (APC). The dose of administration of an immunogen can influence its immunogenicity. There is a dose of antigen above or below which the immune response will not be optimal. Generally the subcutaneous route is better than the intravenous or intragastric routes. The route of antigen administration can also alter the nature of the response. Antigen administered intravenously is carried first to the spleen, whereas antigen administered subcutaneously moves first to local lymph nodes. Substances that can enhance the immune response to an immunogen are called adjuvants. The use of adjuvants, however, is often hampered by undesirable side effects such as fever and inflammation. When the immune system encounters a conventional T-dependent antigen, only a small fraction (1 in 104 -105) of the T cell population is able to recognize the antigen and become activated (monoclonal/oligoclonal response). However, there are some antigens which polyclonally activate a large fraction of the T cells (up to 25%). These antigens are called superantigens. Examples of superantigens include: Staphylococcal enterotoxins (food poisoning), Staphylococcal toxic shock toxin (toxic shock syndrome), Staphylococcal exfoliating toxins (scalded skin syndrome) and Streptococcal pyrogenic exotoxins (shock). Although the bacterial superantigens are the best studied there are superantigens associated with viruses and other microorganisms as well. The diseases associated with exposure to superantigens are, in part, due to hyper activation of the immune system and subsequent release of biologically active cytokines by activated T cells. Hey ! I learned a lot from the facts , Does someone know if my company might be able to get a blank NYC DoF NYC-RPT form to use ? Greetings luke collins ! I accessed a sample DA 2823 version here “https://goo.gl/rVlRX9”.